Apparently I have a thing for roasting beef around midnight, it’s like my witching hour. But actually, it’s the only time that really makes sense to cook a large dinner most days of the week (although, does making dinner around midnight really make sense? Not really). This time around, the clock was ticking on a piece of beef in the fridge, and the best before date had crept on us. We’ve all been there right? You buy something, excited to cook it, and before you know it, it’s almost expired. With no time to waste, I got to work! Inspired by Beef Wellington, I covered the roast with Mushroom Duxelles; a blend of mushrooms, garlic, thyme, and shallots, typically placed between the filet of beef and puff pastry of a Wellington. After rubbing the roast with a generous amount of Dijon, I crossed my fingers and hoped the Mushroom Duxelles would stick to the beef. It was a success! I used my tried and true method for roasting beef, and soon we had a beautiful medium-rare beef, with a delicious mushroom crust. Now comes the sad part. As soon as I decided to roast the beef, I texted Shan “Don’t eat anything after work, I’m roasting the beef!!”. Unfortunately, working in a busy restaurant there isn’t time to check phones, and sure enough Shan ordered food as her shift was ending, only to check her phone right after…her loss! The roast came out great, and we had plenty of delicious leftovers. Perfectly cooked beef, surrounded by a crust of mushroom duxelles. The day before roasting, salt the roast with a teaspoon of table salt, evenly rubbing the outside of the roast. Once salted, tightly wrap the roast in plastic wrap, and allow to rest in the fridge overnight. The next day, take the roast out at least an hour before cooking, allowing it to come to room temperature (it's very important to have the roast near room temperature, which will help it cook evenly). Once roast has come to room temperature, unwrap from plastic wrap, and pat dry with paper towel. While oven it preheating, on your stove, get a heavy bottomed pan (cast iron is preferred) on medium-high heat, with about a tablespoon of olive oil. Once heated (the olive oil should just be starting to smoke), place the roast in the pan, allowing it to get a golden brown sear on each side (this will take about 3 minutes per side). While roast is searing, prepare the mushroom duxelles. In a food processor, combine mushrooms, shallot, garlic, thyme, and black pepper, processing until finely minced. Once the roast is seared on all sides, remove it from the pan. Using the same pan, reduce heat to low, and add one tablespoon of butter, then the mushroom duxelles. You're not looking to cook the duxelles, you just want all the mushrooms to soak up the oil and butter. If the mushroom duxelles is a little dry, add in some more butter. Rub the roast evenly with two tablespoons of dijon mustard, followed by mushroom duxelles. Insert oven-safe meat thermometer into the roast, place on a baking tray with a rack, and place in the oven. 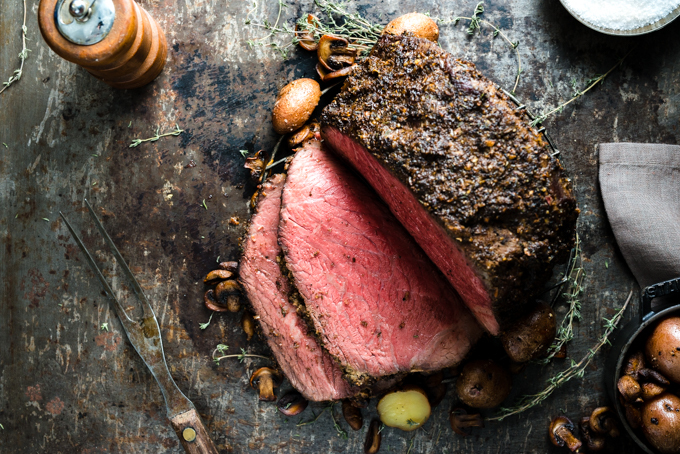 Cook the roast for about an 1 hour and 20 minutes (If you're using a larger roast, the timing may need to be increased), or until the roast reaches an internal temperature of 120F for medium-rare, or 130F for medium. 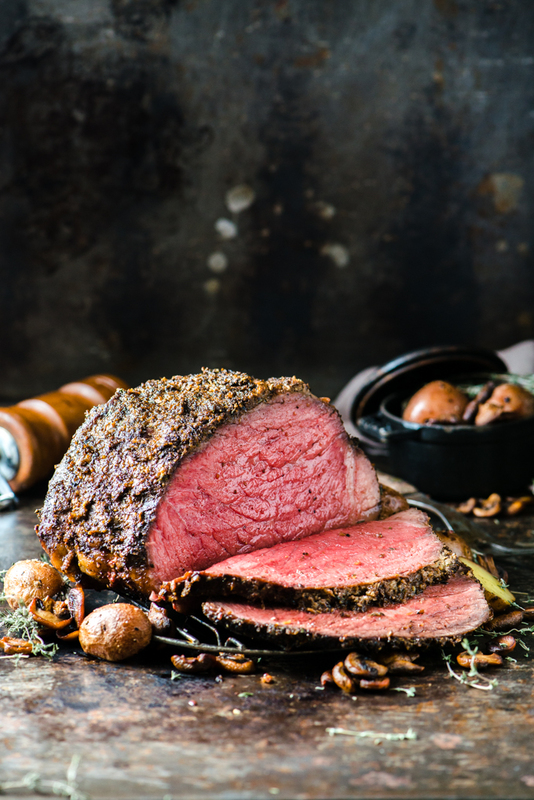 Once the roast has reached 120-130F (depending on desired doneness), turn off the oven and let the roast rest inside the oven, 30-40 minutes, until the temperature rises to your final temperature (around 130F for medium-rare, or 140F for medium). Do not open the oven door at this time, as you want to keep all the heat inside to let the roast continue cooking. Once the roast has reached your desired temperature, remove from the oven and allow to rest about 10-15 minutes before serving. I would strongly recommend buying a meat thermometer for this recipe. If you're roasting any piece of meat that is at least $15, it is well worth the small investment to ensure things are properly cooked! What a treat that is. So delicious looking. Thanks Elinor! It was great :). This looks absolutely wonderful. I can totally imagine homemade mayo + cranberry sauce to go with it. Congratulations for great work! Thanks Cigdem! We’ve never tried that combination, but it sounds interesting! Do you think this would work with a clay roaster? Not sure what you mean, Elizabeth. You don’t need to place it in a roaster, it just goes straight into the oven, on a rack! This looks amazing and I would like to make it for my holiday dinner. Can this recipe be multiplied pretty easily? I’m having 9 people for a holiday dinner–can I just triple the recipe? Thanks in advance for the help! It should work no problem with a larger roast, just make sure you extend the cooking time accordingly! 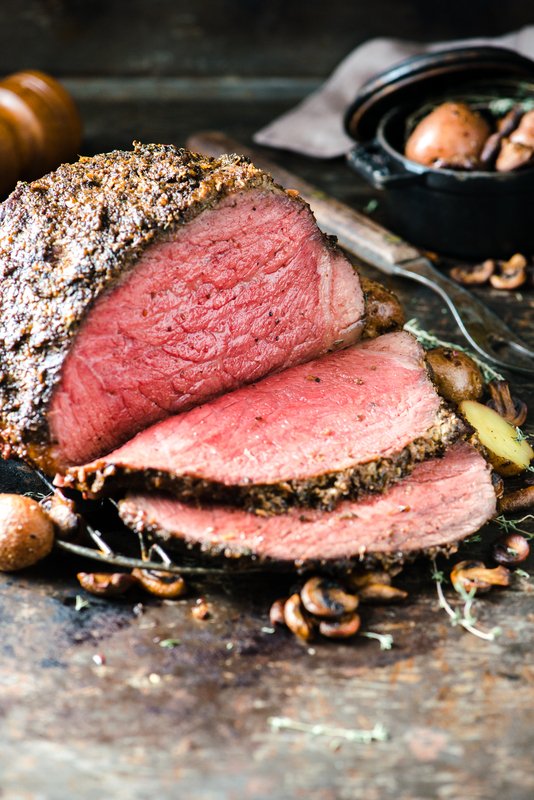 Your roast looks mouth-watering delicious! I’m looking for a roast that would go well with a creamy horseradish sauce. What do you think, will the flavors complement each other?